Learning how to grow bigger, better tomatoes... 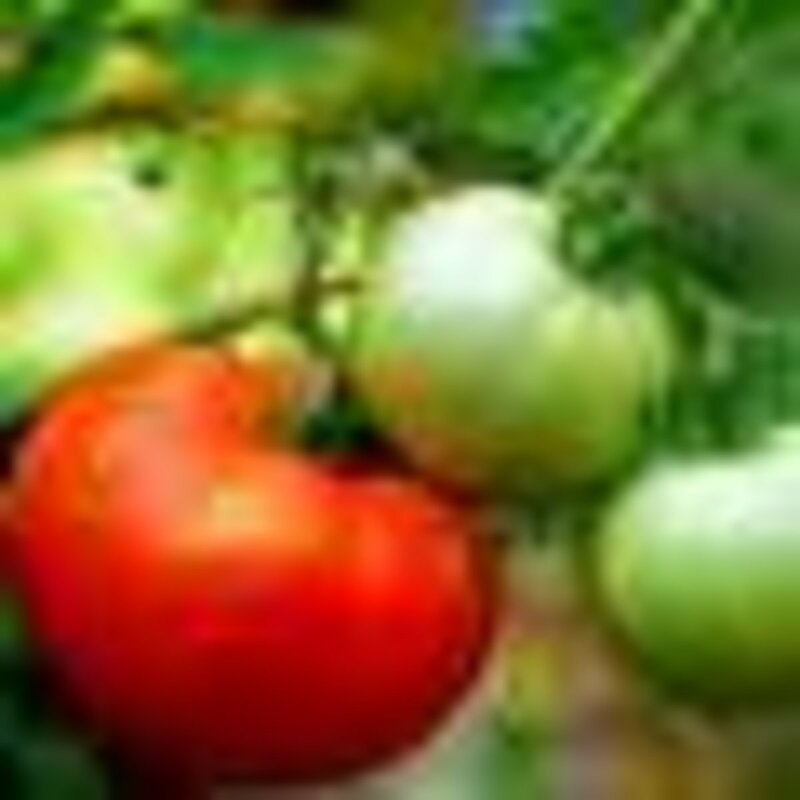 Whether you are a beginner at growing vegetables or a Master Gardener, these tips for growing tomatoes will help you increase your yield and produce better tasting tomatoes. Seed packets and plant packs tell you how to plant tomato plants but they do not tell you how to care for them properly. Nor do they provide you with tips for growing tomatoes that have been discovered by experienced gardeners for hundreds of years. Many gardeners search for tips for growing tomatoes because their plants do not produce high yields as they assumed they would. The main problem is usually caused by improper growing techniques. These tips will help you to grow bigger, better tasting tomatoes in no time. 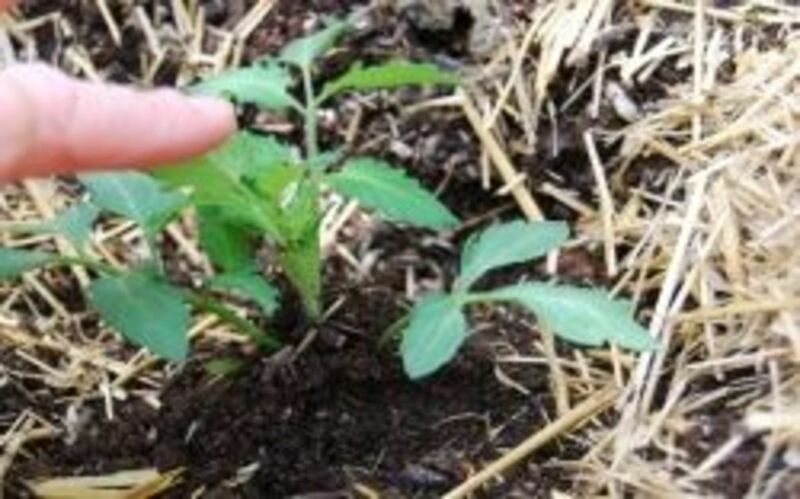 When planting tomato plants you should always plant them as deep as you can without any leaves touching the ground. By burying the plant deeper, the stem will have more contact with the soil and produce more roots. The increased root system will help increase the moisture content by having more roots to take in more water. The larger root system also helps the plant 'anchor' into the ground preventing it from bending over and being damaged by storms and high winds. 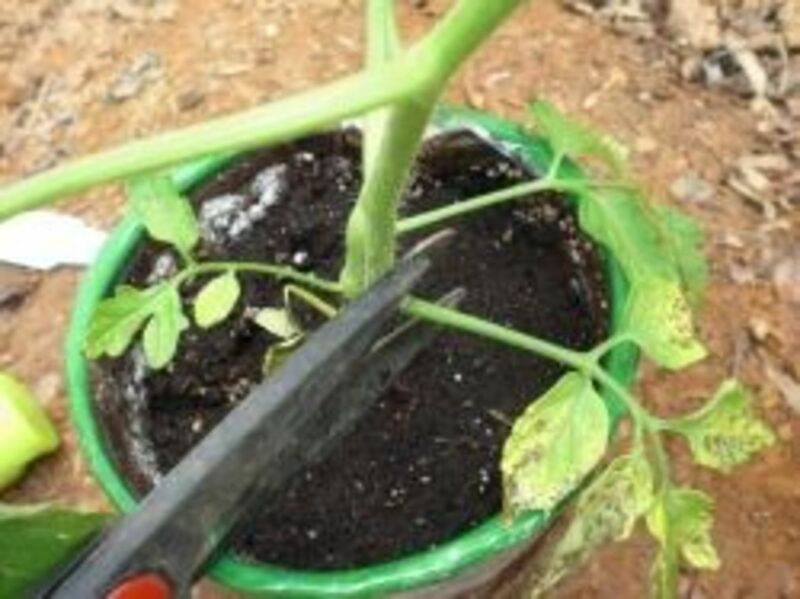 After your tomato plants become well established remove the lower leaves to promote new growth at the top. The lower leaves will be shaded out by the upper portion of the plant and therefor render them useless since they will not be getting enough sun to actually produce photosynthesis. Once your tomato plants reaches two feet high remove all of the leaves on the bottom half of the plant. Use snips or pruning shears to prevent damage to the stalk. Removing these leaves will also prevent soil born diseases by preventing the leaves and stems from touching the soil. Suckers are the stems that grow between the stalk and a mature stem. On mature plants that are over 3 feet high they should be pinched out as soon as they begin to develop since they will not produce fruit, cause over crowing and will cause increased shading. The increased shading will decrease photosynthesizing and reduce production and quality of taste. Some tomato growers do not prune suckers. It is not required but do know that doing so will allow more energy to the main portion of the plant, more sugars to the tomatoes, and better shape. Mulching around tomato plants will conserve water and help to warm the soil and promote a healthier root system. 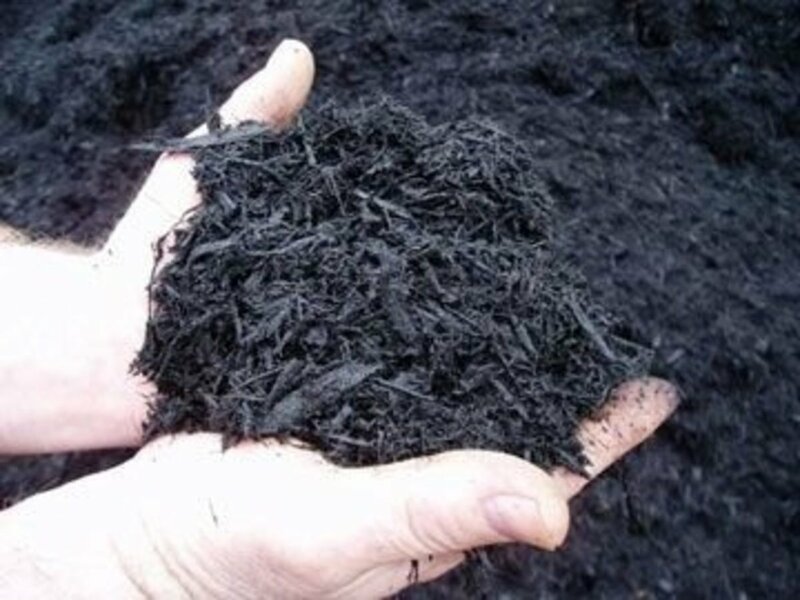 Mulching will also prevent soil born diseases by minimizing plant contact with the soil. Snails and slugs can quickly take over a tomato bed without the proper prevention methods in place. To avoid using harsh chemicals near your tomatoes simply lay copper strips or copper pipes around the perimeter of your tomato garden. The copper will create a chemical reaction that will prevent slugs and snails from invading your tomatoes. Using tomato cages around your tomato plants will prevent your tomato plants from toppling over. Cages support tomato plants and protect them from high winds. Upright tomatoes have less stress on their stalk allowing them to move more energy and nutrients to the tomatoes creating bigger, better tomatoes. When growing tomatoes from seed or planting new tomatoes plants in your garden give them plenty of space. Allowing 2 to 3 feet of space between each plant will allow plenty of sunlight for to reach the lower portion of your tomato plant. 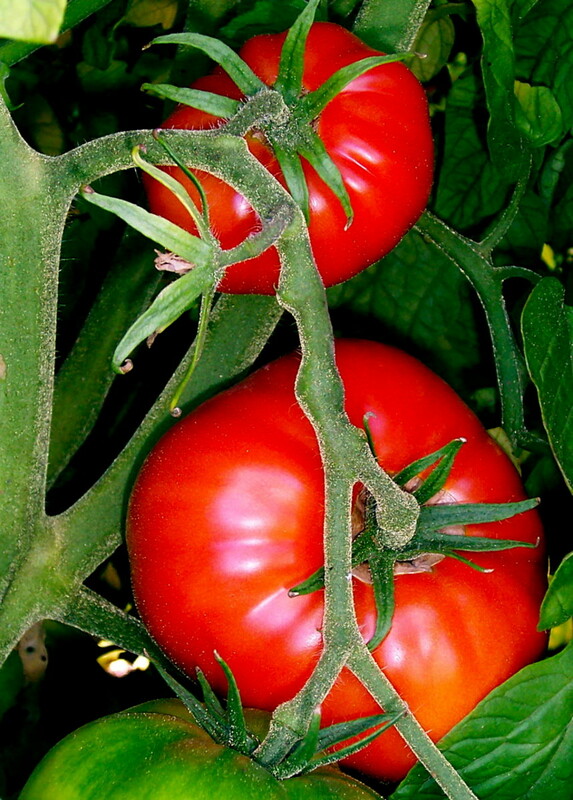 This will increase photosynthesis and give you healthier plants and better tasting tomatoes. During hot temperature tomatoes will sometimes split and crack open rendering the tomato useless. This is a sure sign that the tomato is not getting enough water. Refer back to the tips above on properly watering tomatoes. Epsom salts have been used for generations to promote growth, stronger stalks, prevent yellowing of the leaves and to extend the growing season. Epsom salts can be applied to the soil at planting or watered in during the growing season. When adding Epsom salts to the soil, scratch in one tablespoon in the hole prior to planting. To water in Epsom salts you will want to add one tablespoon of Epsom salt per gallon of water and apply to young plants. After the initial application at planting, continue to water in Epsom salt using one teaspoon per gallon of water every two to three weeks. Doing so will had magnesium and sulfate which will produce strong, healthy plants. 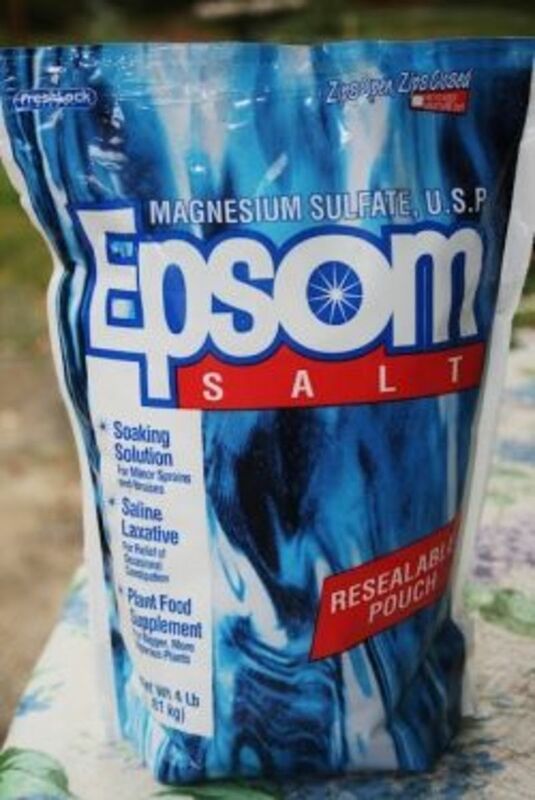 You can save a ton by using Epsom Salt vs Magnesium Sulfate....check the prices next time your are at the store! Watering tomato plants often seems pretty obvious. We all water our tomato plants and think nothing else of it. However, you may be watering them wrong. Tomato plants should be watered from the bottom first of all. This prevents water from splashing and spreading diseases. Next, when watering your plants water them slowly so that the water seeps into the ground instead of producing run off. Water them deeply by extending your watering times. The deeper you penetrate the soil the more water the roots will be able to take in. It will also allow the soil to stay moist longer preventing the tomato plant from drying out. After watering your plant use a spade or shovel to dig back a portion of the soil and check the soil. You want to have at least 6 inches of wet soil but more is better. If the soil is not wet enough continue watering and check another spot shortly after. Once you have done this for a week or so you can get a pretty good idea of how long you need to water your tomatoes to make sure you watered deep enough. Planting marigolds near tomatoes create a lovely contrast of colors and height in your garden. Besides adding beauty, marigolds have another benefit- they prevent nematodes. 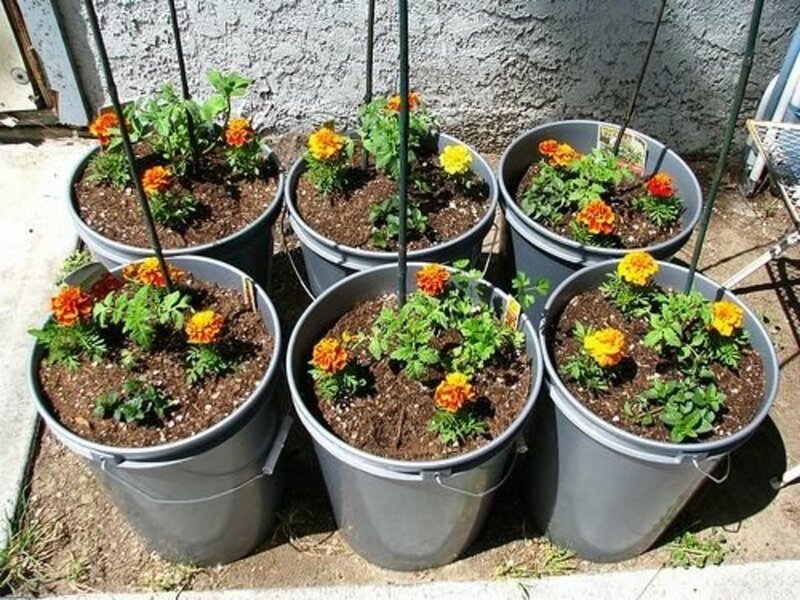 Plant marigolds of any variety near the base of your tomato plants and keep them tended. Their smell and foliage prevent nematodes from attacking your tomatoes allowing them to be healthier and produce a better crop. Want to improve the taste of your tomatoes? Use garlic. Planting garlic bulbs near your tomato plants will not only improve the taste of your tomatoes but will also reduce fungi and improve the overall quality of your tomato plant. 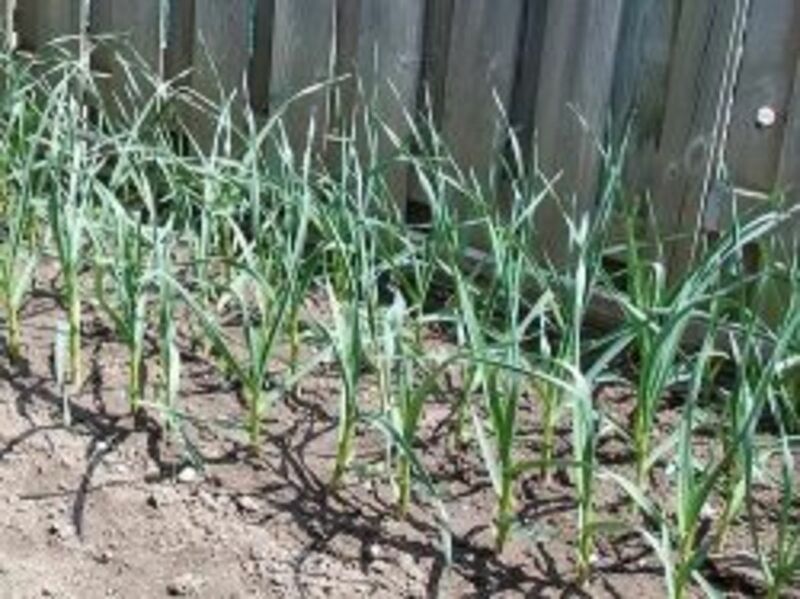 If you have no desire to plant garlic in your flower bed you can still get the same effect by mixing a few crushed garlic cloves to a gallon of water and mix into the soil. Like most field crops, the planting area for your tomatoes needs to be alternated every few years. Tomatoes should only be grown in the exact same spot for up to three years. You can rotate them yearly if you have the space, if not every three years will be fine. After three consecutive years of growing tomatoes in the same spot, the soil become less fertile. Less fertile soil will grow less productive plants. Stephanie Manning is a participant in the Amazon Services LLC Associates Program, an affiliate advertising program designed to provide a means for sites to earn advertising fees by advertising and linking to Amazon.com. Have questions? Tips? Ideas? Share them here! Always check the following, days to maturity of fruit, cold set or hot set for pollination, determinate or indeterminate. Short seasons require short days to maturity such as 50 to 60 days. Cold set varieties will set when night temperatures are below 60 degrees but hot set varieties won't. If you live in a cooler climate this may require only cold set for your garden. Determinate plants use less space. If your space is limited you may not want the longer vines of indeterminate which will require taller cages and much more support as well as more watering, attention to removing suckers, and greater protection from winds. So many things that I didn't know. Thanks! These tips are amazing. My tomatoes last year had a lot of issues, this year im going to use these tips and grow some award winners! Only question, is overwatering the only thing that makes tomatoes split? I read somewhere that the Epsom salt helps t he skins to expand without splitting? somewhere. Finally I remove a third spade deep section of usually subsoil type and move it to start a third pile somewhere out of the garden. I move down the length of the bed moving the top third of the soil to the bottom of the section removed. I add composted loam, hardwood leaf mould, worm castings, composted rabbit and or cow manure. I move the second third of the soil from the next section of the bed onto this and mix together well. I next remove the third spade depth from the garden. I continue like this to the end of the beds length using soil componets moved to that end to finish the bed. Yes this is very labor intensive but only needs to be done once every decade or two if beds are maintained well. After my beds in an area were completed I moved the top two spade levels of soil from the 2-3ft walkways left between the beds onto the beds and replaced it with subsoil removed from the beds. I finish by adding sand and limestone chert sized gravel to the walkway. Over time as i have added chert gravel this has produced a solid stone like walkway. I protect the edges of my beds with used brick and safe borate treated white oak, sassafrass or eastern cedar planks. 2. I drive steel fence posts every 2-3ft (depending of variety size) in the center of the bed. I attach 2"+/- safe borate treated debarked sassafrass, white oak, eastern cedar or dogwood sapling poles to the steel posts with #12 to #10 copper wire. To grow larger earlier crops I plant tomatoes between the posts and train them to the posts removing all the early suckers and removing fruiting buds from later suckers. I also have also sometimes attached steel fencing or reinforcing wire panels and trained the tomaotes through the fencing from small later crops like canning tomatoes. On these I remove early suckers, but after plants are three feet or so tall I simply train sucker through the fencing. Excellent tips. I just put some tomatoes in my raised beds and will be trying some of these tips. 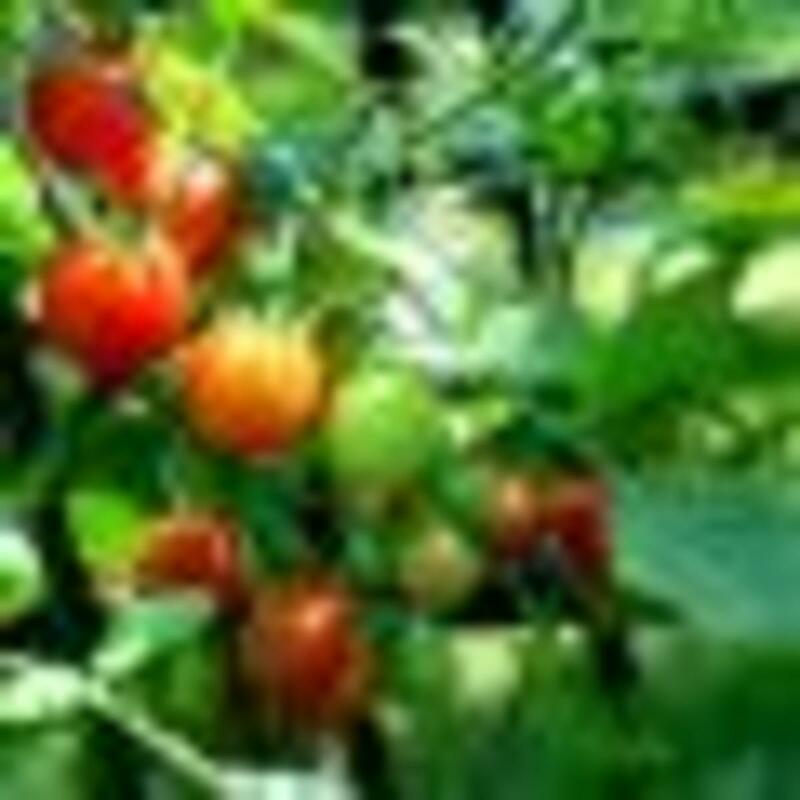 I`ve started my own vegetables and these tips for growing better tomatoes are very good. I`ll surely be following them. Thank you. Girlfriend will love this. She has had a bunch of problems with splitting tomatoes. Tell the wife as she is the one who is the gardener in our house. Seriously I will pass this one onto her to take a look at. Splitting tomatoes has been an ongoing thing in my property and though I am an avid research kinda gal for some reason this is just something that I never gave much mind to... Now I will! Thanks for the info!! I just love tomatoes. I love to eat it raw. Had a single plant before but now it has died because of the heat. I did not know about the benefits of using epsom salts or planting marigolds or garlic around your tomato plants. We plan to try this on our upcoming growing season. I started my tomato plant (nursery bought) with initial preparation of the pot which is about 35 gallons with mushroom compost, two handfuls of fish meal, couple of aspirin tabs, crushed egg shells plus one cracked egg, handful of bone meal, veg and herb fertilizer (4-6-3), baking soda pinch, coffee grounds on top to work as a mulch, 1 tsp of sugar, limestone, horse manure and some Epsom salt. I read a few articles on tomato growing tips and I hope the crop will be as promised. We have decided to dedicate an extra large area in our garden for a variety of tomatoes so I thank you for all these growing tips! Thanks for the tips the epsom salt one was new for me. Thanks for the tips! I want to try epsom salts... never tried on tomatoes. I give my roses a dose and they love it! Crushed egg shells mixed with used coffee grounds to add calcium and prevent blossom end rot poke a few holes with something round, like a pencil, down to the roots and pour in the egg shells and coffee grounds. Feed with liquid fish fertilizer too for huge healthy plants and tons of sweet fruit. The tomato planter is now on my wish list! I really don't want to get big heavy terra cotta pots.Terrific lens! Does the copper around the garden have any effect on the plants? This is a great lens. I already use many of the tips but I'll be using the Epsom salts as well now! I'm putting together a lens about growing tomatoes in small spaces and really would like to link this lens to it if i could. Would that be OK? Anyone who has ever tried growing tomatoes knows it is one of the most satisfying things about gardening. 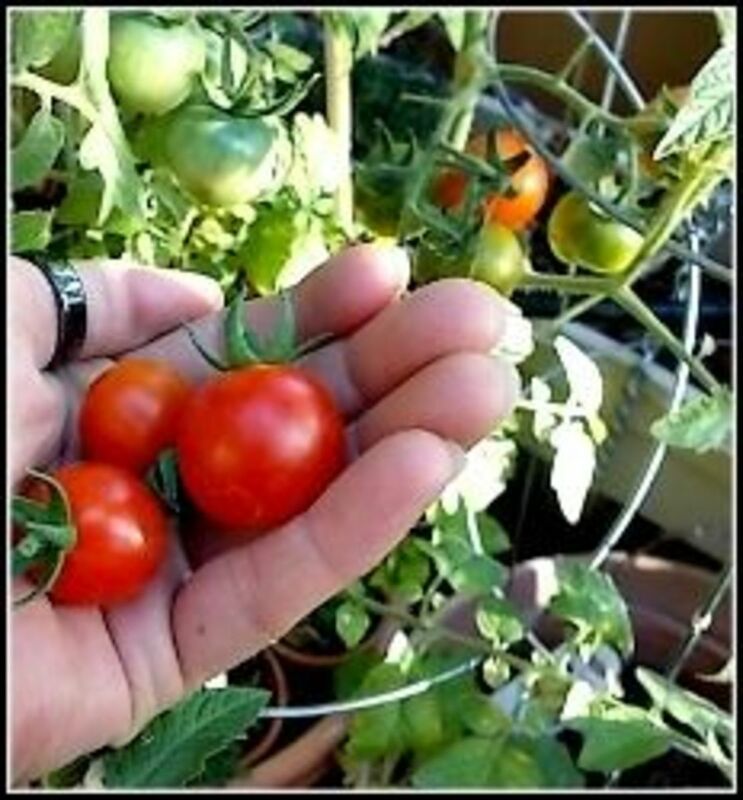 Thanks for tips for growing tomatoes because their plants do not produce high yields as they assumed they would. You want some really easy treatment for your tomatoes get some Sumagreen Ag on you tomatoes. Best tasting with very little work needed. A spray bottle and three treatments and you're done. Just make sure you have TALL wires for your plants as these babies will GROW! Bigger and better. Nice lens. Good tips. thank you for sharing! Thank you for the great tips. I've never been able to keep my tomato plants alive for very long; now I can't wait to give it another try hopefully with better results! One thing that I do that wasn't mentioned is to add humis/ manure mix that I pick up at Home Depot. I add it to the soil before putting the plants in the ground. I also use the epsom salt solution. It really works! I am getting more tomatoes than the 2 of us can eat in a week. 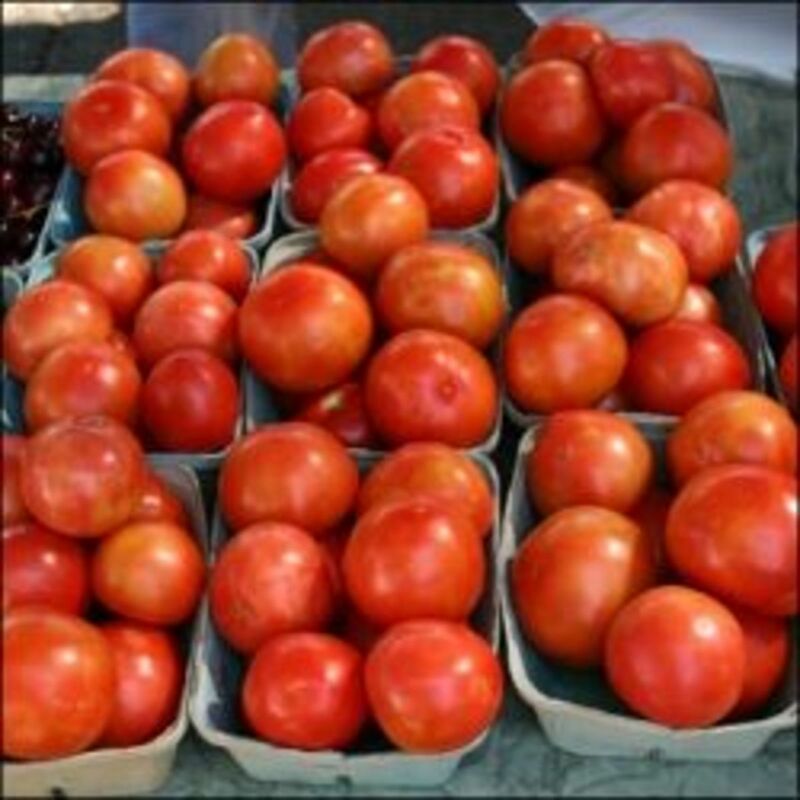 Is it better to grow tomatoes in the fall in southern Arizona? Found this lens at exactly the right time, as I've just planted a few tomato plants. 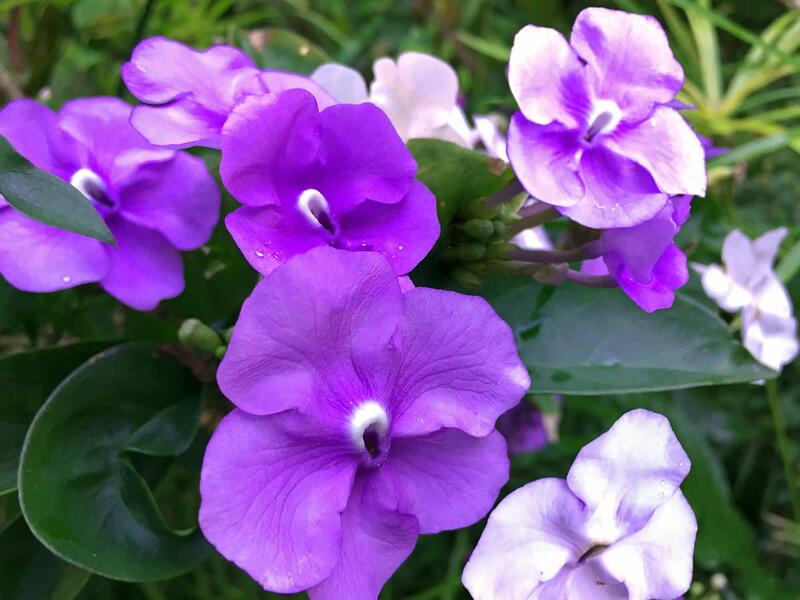 I hate them, but my partner loves them, so we always plant some. Didn't know about the copper wire tip. Interesting. I didn't know about the copper trick. What's your favorite variety to grow? Nice tips. I am interested in planting some vegs on the windowsill. Dan , great informative lens, thank you for sharing this informations!! I've been looking for help to get my tomatoes growing better. Thanks! Tobacco, growing near the crops, also helps prevent pests, check my lens about growing it out. I am ecstatic about these tomato tips! I hope this sure ends my frustration with low yield, yellowing leaves and nematodes. Thanks for these very useful tips! How do you grow tomatoes without getting tough skin on them. Grow the best tomatoes with SumaGreen. 100% chemical free. "Liquid mother nature".. microbes that feed your soil, and improve the quality and quantity. I use it and it's unbelievable! contact danu2@ptd.net for more info. I'm experimenting with tomatoes this year. I have some in planters, some in the garden and a couple in those topsy-turvey things that hang them upside down. I think I planted the ones in the container too close together, but they're growing well so far. I wish I'd known about the garlic companion planting earlier though. Nice tip! We have been having so much rain and my plants look so yellow and wilted. I planted deep, removed suckers and have kept soil loose. I have not mulched yet because it was not recommended for the mid-Shenandoah Valley until the end of June. I just heard about the Epsom salts and bought some. Since we are having a tremendous amount of rain, I do not want to add more water to my plants. Can I just sprinkle the Epsom salts around the base of the plant and work into the soil? Many thanks for any help! Very valuable post.I really like all the tips.Thanks for sharing this post. A really nice lens with very helpful information. I've just bought my first home with a garden, and am looking to grow my own veg. Thanks for the info! Great lens. Great info and tips here - have only grown once or twice - like your idea of growing beside garlic! Very valuable advice. Just what I needed. I am just a beginner when it comes to gardening, and I will take all the help with growing tomatoes I can get. Rather than planting our tomatoes deep, we prefer to trench plant them. Just dig a trench as long as the plant is tall, lay the tomato plant down in the trench and cover all but the top 3 or 4 inches. You get a great root system and healthy strong tomato plant. These are some great tips, thank you very much for the awesome lens. Great list - I've only been using about half these ideas, so hopefully I can double my crop! thank you for this lens. Thank you for your great lens. A lot of good information. I plant my tomatoes on Saturday for the first time , and your lens will help me for sure. Thank you for your share. Nice!! Large tomato plant from the farmers market came with a metal cage around roots. Should I remove that or leave it on? Thanks a bunch for the tips! have been trying to grow tomatoes for some time now but after the first harvest the others come out smaller. Will try the out asap. Great tips. Tip #1 was a revelation to me. Haha. We take things for granted. @anonymous: Try non fat powdered milk for calcium too. 1 tbsp per plant. I have 10 plants that are no more than 3 feet tall and each has at least 12-18 tomatoes on each of them. I fertilized 1 time when I tilled the soil, then planted in rows. Bury them deep. Even bury up or over the first leaves of saplings. Remove suckers. I like to let the plant split so I have 2 branches so I do not remove the 1st sucker but start from there. Use mulch. It is a must. 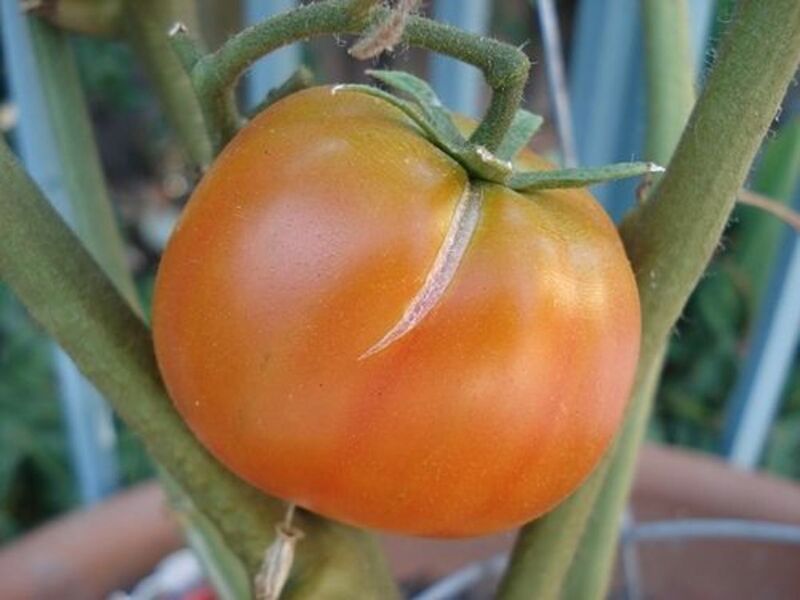 Make sure after rain that your soil has enough potassium or the fruit will make a black spot at the bottom of the tomato. If you are in the south then the plant does not need to be in direct sunlight. Morning sun only. If not they will burn up quick. When plant stops producing in mid summer, woop the plant with a broom or a switch. breaking a few branches. 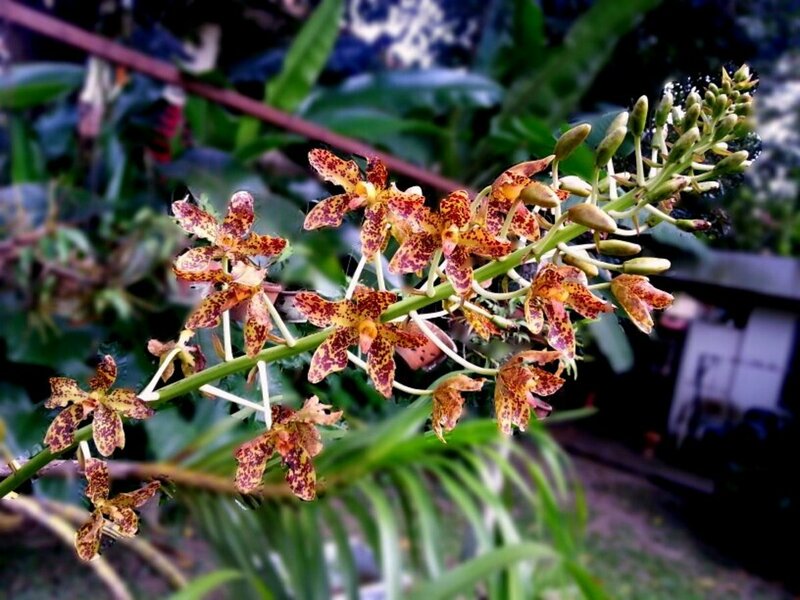 It stimulates the plant to start making blooms again new growth. Old trick from me grandfather. It works. @anonymous: I saw a tip on the TV about using the copper wire scouring pads you can buy for cleaning dishes, stretching them out and putting them around the rim of your pots, you can normally pick up large packs of them cheaply if you know where to go! I am growing tomatoes my self and i like this lens . Loved the marigolds and garlic tip. Great lens! Awesome tips! I'm still a beginner and will try out your tips this year! 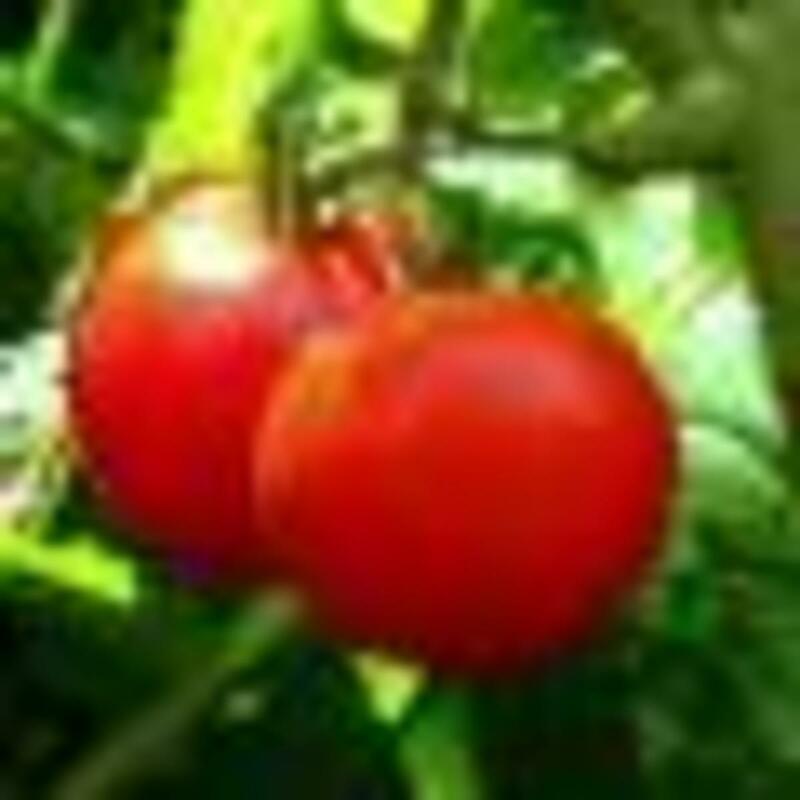 @anonymous: It could be blossom end rot which is caused by low calcium. Check your pH and use Lime to bring the pH up to 6.5 to 7.0 (ideal) 7.5 is ok. If your pH is already in this range, I use a liquid calcium fertilizer several times throughout the year. I have heard of people using ground egg shells, about 6 / plant, mixed in the soil at planting. going to use some of your tips this year. Nice work! Who doesn't like big, ripe tomatoes? Last year the ends of my tomatoes would go brown. Any tips on how to prevent this. This will be year two of my garden so I'm sure it's an easy fix, but I'm still learning. Thanks!! You said copper to keep away slugs - where can I get copper? It's very expensive! I haven't found a really good solution for slugs that doesn't take a lot of time - I've used sand, diatomaceous earth, beer, slug bait. When it rains, you have to apply it all over again. thanks for the very useful lens. my young dragon fruit seedlings and young orchid shoots will now be slug and snail proof! I knew about the marigolds but I'd never heard of planting garlic with toms. I'm going to put our toms out as soon as the frost has gone and I'll do it then, since I love growing garlic anyway. Very interesting lens. I tried to grow tomatoes ever year. Didn't go very well :). Very nice lens. Thanks for all the great tips. Tomoatoes are pretty delicate and require high level of nutrients. I've tried growing tomatoes in my aquaponics garden and they require a denser population of fish to provide sufficient wastes. For those who interested in veggies gardening, growing tomatoes is a must. I didn't know about the marigold and garlic tips. Great information! There is nothing in the world better than a home grown tomato. I'll have to refer back to these tips this year as I am working on our garden. Thanks for sharing! Thanks for some great tips! I had heard of some of them but will be trying out the others this year in the hope of getting a tastier crop.